The world of comics, from Hollywood to the toys you buy for infants, is packs with sexism. Last January, I shared a letter from and 11-year-old girl to DC Comics, asking them to merchandise more girl-related products. The letter went viral. Now DC has released the "Hero Girls," a pretty great line of products. They actually emailed me and Rowan's parents specifically to let us know about it. For Salon, I have a piece on sexism in the comics world. Can the Hero Girls save the day? The answer is maybe - they are good products, but are still part of the sexist world in which they were made. Image Description: Five super hero girls soaring off in five different directions. Overall, I’m pleased. The aesthetic is athletic and non-sexualized. It fills a huge void, appealing to girls who want characters with whom they can identify. I’m the father of a six-year-old girl who likes nothing better than to grab a helmet, cape, Thor hammer, Hawkeye bow, and go fight bad-guys. She’s happy to play with toys associated with male heroes, but she does ask about the girls. I expect to be sending DC a lot of money on this new line. 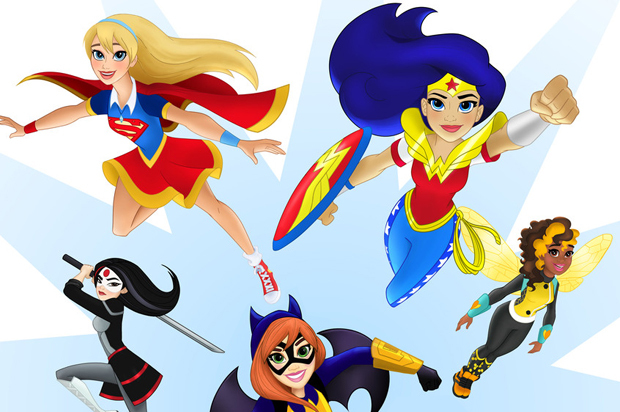 Diane Nelson, President of DC Entertainment, proclaimed Hero Girls, “just for girls.” This exclusivity has sparked some debate about the consequences of segregating products by gender. They may be good products, but it’s revealing that DC is answering the call for better gender balance by creating girl-only products. Such characters provide role-models that otherwise were missing, but also perpetuate the assumption that boys can’t identify with girl heroes, and that truly co-ed teams of superheroes are impossible to market to kids. Please read and share the original piece at Salon. Freelancers depend on clicks and shares to get asked to write again!